For years we have worked to resolve the Exide issue, from closure to cleanup, and while we are encouraged by the Governor and legislature allocating $176.6 million to go towards the cleanup effort, our members had concerns that a California Environmental Quality Act (CEQA) exemption, pushed by the Governor and Assemblymember Santiago, would present more problems than solutions. CEQA ensures that environmental and health impacts of projects, in this case testing and cleaning up lead contamination at thousands of homes, are studied and impacts are properly mitigated (adequately dealt with so we are not forced to shoulder the burden, in this case further lead poisoning and other impacts). With informal processes outside of CEQA, responsible parties, in this case the state, can make promises through “parallel processes” (conversations with interested parties, in this case the community) and fall through without any accountability. This has already been the case as we have recommended how to better protect our communities with the residential lead cleanup that has already happened, and for months have been largely ignored despite the fact that it has been discussed and documented in an Advisory Group hosted by state and regional agencies. Our community leaders have been involved in this fight since we were speculating the extent of contamination from Exide, to the point where many of them have now found that they are Priority 1 or Priority 2 properties (levels of lead in soil that classifies their property as toxic waste or near toxic waste), mostly families with children and infants in the household. It is these leaders who have provided vision and energy throughout the fight to shut down Exide and clean up contamination. It is also these leaders who took the position that CEQA exemption is unacceptable because of the danger irresponsible cleanup efforts pose. We agree with and support the perspective of some DTSC staff that the Exide Advisory Group would be an appropriate place to plan what scoping for the CEQA process should look like. We have worked to raise the visibility of the matter through print, radio and TV media. We have presented at countless community meetings and classrooms, knocked on thousands of doors, and collected hundreds of access agreements. Most of this was done before DTSC, or anyone else outside of our communities (and most elected officials within our communities) were interested in engaging with us to develop their skills in working with community to build trust and process access agreements to move community cleanup forward. We definitely want to recognize Supervisor Solis and the County Department of Public Health, City of Commerce Councilmembers Oralia Rebollo, Tina Baca Del Rio, Ivan Altamirano, Leila León, and Assemblymember Cristina Garcia, who stepped up to support the efforts of our members to fill the gap that existed in outreaching for access agreements. After some turnover at DTSC, their staff became much more engaged. It wasn’t perfect, but it was progress, which we are willing to work with. Earlier this year we even agreed to take on a short-term outreach contract and brought on two part time staff members to lead the work, both of whom are currently awaiting cleanup of the properties where they live. Unfortunately, we have experienced issues and weeks ago decided we would not be interested in conversations on possibly extending the contract. We decided not to extend our contract with the state to do outreach and access agreement enrollment for multiple reasons. First, it has been extremely difficult working with the state, with DTSC in Sacramento taking a one month break from processing forms without letting anyone know, including their local community engagement staff and lead contractor, and DTSC in Sacramento potentially losing signed access agreement forms we sent them. This sort of breakdown is not something we are willing to work with. More importantly, we stepped in almost two years ago to focus on informing impacted residents on the issues and cleanup opportunity, support them in requesting cleanup, and serving as advocates throughout the cleanup process because the state wasn’t doing it effectively, and no one else was stepping up. DTSC is now moving to hire new outreach staff to do the access agreement enrollment, and are planning to open a local office. With this new capacity, we can step away from leading this work and continue to keep the agency accountable. We have been successful at pulling the state along. The next steps in the push are to expand the area being sampled from 1.7 miles from Exide, to 4.5 miles, given that the state released blood lead data for children under 6 that shows higher rates of exposure up to 4.5 miles from Exide. Additionally, we will be working to lift the conversation for addressing the health and social impacts of Exide lead exposure over the last 30 years and call for resources to address these issues (to fund early child development programs, nutrition programs, youth employment, reentry programs for the formerly incarcerated and other support services to address impacts on educational attainment and levels of violence related to lead). Concerning the $176.6 million allocated for residential cleanup, DTSC in Sacramento failing in the access agreement process has highlighted the division between departments within DTSC, community engagement staff left to fend for themselves while having to cover for failure in other areas of the agency. It is becoming clear that this is what has happened over the years with the permitting and enforcement areas of the agency as well. Community engagement staff should not be used as public relations shields, they should be working to keep us informed so we can hold the agency and industries accountable. It is our position that, along with new funds dedicated to community cleanup, the state should be dedicating significant funding to create an office under Ana Mascareñas, DTSC ‎Assistant Director for Environmental Justice and Tribal Affairs, to build a statewide staff with the capacity to hold the permitting, enforcement and cleanup branches of DTSC accountable and work to ensure impacted communities are able to meaningfully participate in the public processes. This is how culture change can happen at DTSC, and some sense of trust in the department can begin to be rebuilt. Our communities view this money as our money. Why? Well, let’s respond to a question posed by Assemblymember Santiago in his reelection campaign materials. “Who took on Exide and fought to protect our neighborhood?” I am assuming the Assemblymember is genuinely asking the question, since he was nowhere to be found for years. 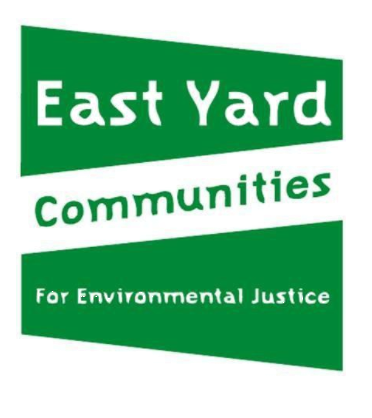 Last year, when members of EYCEJ and CBE met with Assemblymember Santiago, he discouraged us from pressing the state for Exide cleanup funds, dismissing the responsibility of the state in allowing this whole mess to happen. Like the many failures of DTSC, we didn’t allow this to stop us. We continued to press on. Now, we are here with $176.6 million to start a serious cleanup process. This is an opportunity to put the failures of DTSC aside, though we continue to hold that there needs to be an independent investigation of the department in it’s handling of Exide over the last 30 years (US EPA where you at?!). The new DTSC office opening up in the Exide impacted communities, and the staff being brought on to work on the Exide issues, need to hear the demands of our core members, those who have fought for years and continue to wait for a proper cleanup of their homes. 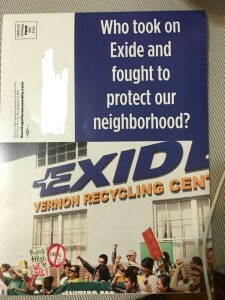 They demand that the local office and staff be dedicated specifically to Exide. They do not want Exide identified funds that were hard fought for to fund any of the DTSC activities unrelated to Exide. This is not an opportunity to pad budgets or fill gaps. Additionally, the DTSC Exide team must be allowed to operate independently from the rest of DTSC. We do not need the failures of the past mixing in to the work moving forward. We propose that a local coordinator from DTSC’s staff be selected, with concurence from the Exide Advisory Group, to run the operations of the local office and Exide related work. DTSC Staff Member Cesar Campos, with his background working with communities, would be a good fit. They shall report directly to Assistant Director Ana Mascareñas and Director Barbara Lee. In our experiences attempting to work with DTSC over the years, we have found that there are those who want to do right by us, and new leadership does as well, but middle management acts as a barrier, miscommunicating, misdirecting, and slowing down progress. This Exide Pod (local office with dedicated staff) can act as a pilot for how future DTSC operations are conducted. The Exide Pod can meet directly with community members every other week, reporting back on progress, and troubleshooting issues that come up. A dedicated local office will serve to meet the needs of any member facing issues related to Exide, from initial information to every step of the enrollment and cleanup process. We have already gotten a taste of what this can look like, with DTSC staff and multiple community stakeholders already engaging in a conversation around the formation of a workforce development and local hire plan for residential cleanup. DTSC has been very responsive to input and seems to actively work to engage interested parties. This promises to be a model for the department, both the plan itself as well as the process to get there. ← Honoring Professor Martha Matsuoka Doing Worthwhile EJ-Social Justice Work? You Want Martha on Your Side!